Every culture has myths of Gods with their magical powers interacting with men. Human faith started with animalism with ideas of totem animals and nature worship. The sun, the planets, the forests, the rivers were all supposed to have a Godly aspect to them. Slowly the Gods of nature began to acquire human attributes but with supernatural powers. Like say Zeus, Thor and Indra, the Gods of thunder and lightning. And a host of other beings came into existence – magical beings that were not really Gods. These were the faerie in Celtic myths, centaurs, dryads, nymphs in Greek myths, Yaskshas, Gandharvas, Nagas in Hindu myth and so on. And a whole set of stories emerged around the interaction of humans, Gods and magical races. Many of the modern fantasy are derived from one or the other of these myths. Now this is the more pragmatic, prosaic view of myths. Now one can instead take a romantic view and ask what if all these stories we read in myths had actually happened? What if such creatures and Gods had actually existed? Science fiction being the fiction that explores possibilities, explores this possibility using scientific or pseudo-scientific explanations. For science fiction is still fiction and does not demand the rigor of science. One of the most popular theories is that these Gods and magical beings were alien beings. Erich von Däniken has written a book ‘Chariot of Gods’ around this theory. In fiction, we have this entire Star Gate series around this theory that makes Gods from Egyptian myth alien beings called Goa’ulds and the Norse Gods alien beings called Asgard. Roger Zelazny has apparently written a science fiction series depicting Indian Gods as aliens. Julian May’s “The Saga of the Pliocene Exiles” takes on the Celtic myth and tries to make the faerie an alien race. 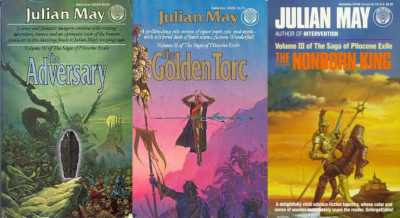 Julian May starts her story in a time in the future where humans have made contact with aliens and have invented time travel. She has a whole series around this world with humans and aliens coexisting and humans developing telepathic powers etc. called “Galactic Milieu”. But this series “The Saga of Pliocene Exile” starts in this world but takes us to an altogether new world. The time travel device is not the usual cliched variety full of paradoxes. This device is a one way device that takes humans to a time way before the origin of mankind – the “Pliocene Saga” – an interim period between the end of the dinosaur era and beginning of human era. A quiet harmless period where human can stay out of harm’s way – both to themselves as well as to rest of mankind. The period supposedly holds no danger and the people who are sent are sent sterilized and without modern weapons so that they are not able to cause sufficient impact to change the future. The people who go there are mostly discontent elements who do not like their current world and long for an older world. So it is a place of safe exile for them where they can live out the lives they want without causing harm or coming to harm. Now the whole calculation goes for a toss when the humans who land in this world discover the place is not uninhabited as they thought but an alien race from a different place and time has come and made this place their home. They take the humans prisoners and make them work for them. But the time travel trip is a one-way journey and they can’t even send messages back to their time. So, more and more humans keep arriving only to be captured by the aliens. The aliens themselves are exiles from their own place and time. They are more powerful than humans due to having telepathic powers, the fact of their having got there and established themselves before the humans and their physical prowess. These aliens do not seem to be progressing technologically till humans arrive. Though humans arrive without any modern technology, they begin to share their ideas with these alien races and soon aliens begin to develop technology. This forms the core of the story – the interaction between the two forms of the alien race and the humans. The two forms are at war with each other. Humans side with one or the other seeking power and some strike out on their own. So, the whole story is a tale of politics and war between the humans and the aliens. What is most fascinating is how many of the Celtic myths play out as the story progresses. The aliens as I mentioned earlier are modeled on the faerie. So, in some ways, many of the events feel like a science fiction reinterpretation of the myths. The author has done a really clever job weaving an interesting science fiction story that seems like a plausible explanation of myths. For if really something like the events had happened in the Pliocene era, the tales carried would have been like the ones we have now. There are two challenges though that probably prevented the story from being as popular as it could have been. The author tries to keep things grey – she does not go black and white. There are a host of characters among the aliens as well as humans – most a mix of good and evil like real people. So as a reader, there is no one character the reader can root for. So, in some ways the intensity is lost for reader ends up getting into these shoes of 20 odd people, some of who may end up dying while other succeed like in Game of Thrones. So reader might not be sure whose part to take in the story. While many may view this as positive, it makes enjoyment a bit lesser from a purely entertainment point of view. Also authors like Herbert, Asimov and Dickson, set up the events towards a grand finale like establishment of foundation, the realization of the golden path or the final reunification of mankind respectively. Julian May does not set up something so grand and so even that is not there as something abstract for the reader to root for instead of individuals. The other problem is language. The author uses too flowery a tongue that is very descriptive and full of difficult words. So that makes the reading a bit of effort. Also, she does not make use of much philosophy or humor to hold the reader’s interest though some may find the flowery language as a pull factor. I personally don’t value beautiful language for itself and see the effort comprehending unfamiliar words worth it only for a great story. I was fascinated by the way she has re-interpreted the old myths most and so I held on through the series. But if that is not something that one finds fascinating, they may not find this series all that appealing. Of course the modern readers who turn their noses up at the usual black and white stories and want it all grey and those who find flowery words elevating may also enjoy the series.